The founder of Rabito chain of skin clinics, who has over 40 years of experience as a dermatologist, explained, that the boxer's bleaching could open up his skin to direct sun burns which result in a disease exogenous ochronosis. "This condition will create dark coloration of the skin and eventually become an ulcer which develops into caner. So if a person like him wants good health and good skin the he should stop bleaching., It is totally unacceptable," Prof Delle, who is also Chairman of the Convention People's Party added. 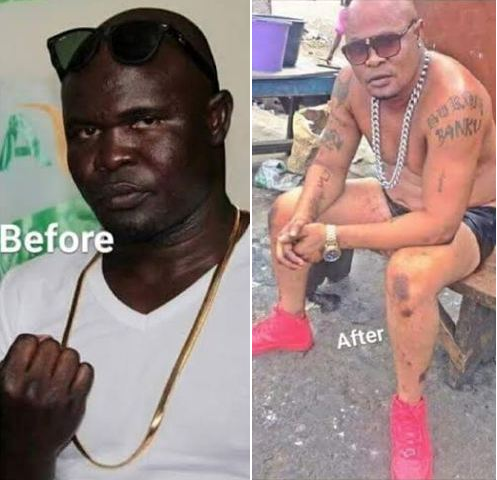 Bukom Banku during recent interview on Joy News TV's Pulse Programme confirmed he was bleaching his skin and to take advantage of opportunities awaiting him should President John Mahama win the 2016 General Elections. "I will become Ghana's Ambassador to Germany if President Mahama wins the election and I want to look like them." "The only two people who can stop me from bleaching are President John Mahama and the National Chief Imam," he told Pulse Host Francis Abban in the over 15 minute interview on the Joy News Channel. The boxer has also revealed that he will take a year's break from boxing to focus on politics so he can help incumbent President John Mahama to retain his seat. "She started the bleaching first and advised me to do same so took it. My skin is too black so I want to become light skinned." The Accra-based boxer, disagrees with the talk about opening himself up to cancer. "God created Michael Jackson differently from me. So what can kill him will not necessarily kill me. So it is possible that someone can consume poison and die but I will do same and live. So it doesn't necessarily mean that I can get a disease out of bleaching, My body is different," said while attempting to sound philosophical. Bukom Banku who is undefeated in 28 fights has had stints with the WBO Africa light Heavyweight and cruiserweight titles as well as the Africa Boxing Union's light heavyweight title.